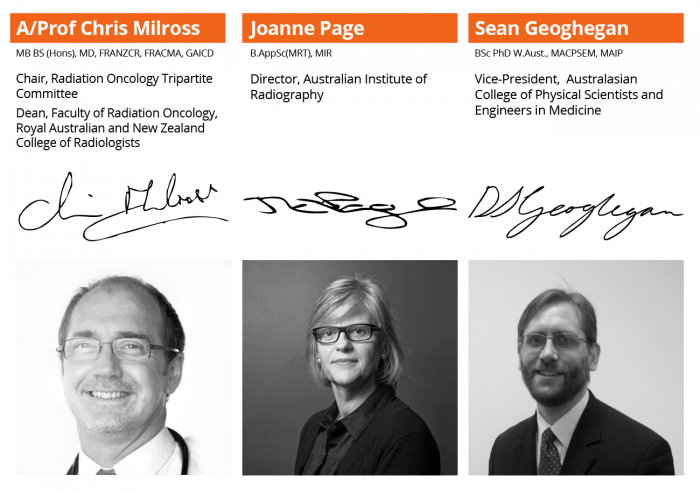 After extensive consultation and twelve months of work we are pleased to present ‘Planning for the Best: the Tripartite National Strategic Plan for Radiation Oncology (Australia) 2012-2022’. It is a decade since the Tripartite Committee undertook a similar strategic planning exercise that triggered the Baume Inquiry. Since then Australian governments have collaborated with the Radiation Oncology Reform Implementation Committee to address many of the issues identified in the 2002 Inquiry. Much has been achieved, yet there are outstanding and emerging issues which are identified in ‘Planning for the Best: the Tripartite National Strategic Plan for Radiation Oncology (Australia) 2012-2022’. As of today only four-fifths of Australians who need radiotherapy treatment receive it. This gap must be closed. The Plan describes the way forward, and addresses the strategic issues important for the delivery of safe, high quality and accessible radiation oncology. The plan does not represent the views of governments across Australia. Governments, professional groups, those involved in advocacy, and patients, must work together to ensure that the gaps in radiotherapy services are closed. We urge that action is taken through the implementation of the 93 recommendations emerging from this Plan. These provide an opportunity to save lives and to prevent Australian radiation oncology services falling behind those of comparable countries. We commend the Plan to you.